The Khyber Pass connects Afghanistan, Pakistan and India and, being part of the silk road, is one of the oldest known passes in the world. This trip didn’t take place in that pass. The Khyber Pass (in Whistler) is an area off the Whistler Peak to skiers (bikers) left and apparently a very popular place for winter out of bounds skiiers to get super lost and get either helicopter rescued, or forced to spend a cold night at Cheakamus Lake before slogging out. 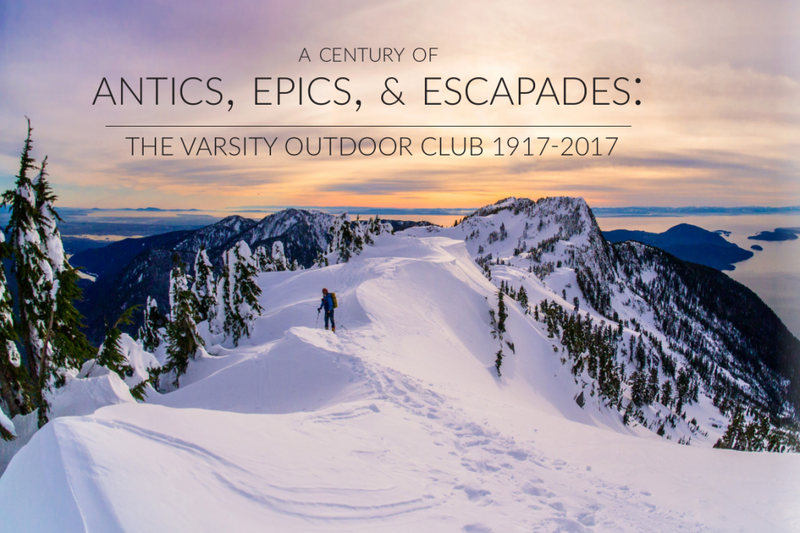 So, with the awesome weekend weather we thought this was a great time to go check it out. We had a relatively casual morning, the plan was to use the resort’s gondola to gain a significant chunk of elevation, get off at Round House and hike-a-bike the logging roads from there to the pass (slack country!). We did some runs in the bike park in the morning riding some fun classics like Ninja Cougar, Una Moss, Too Tight, and Angry Pirate. The dirt was great but the roots were very wet, which tends to want to grab your front wheel and pull you off the trail. 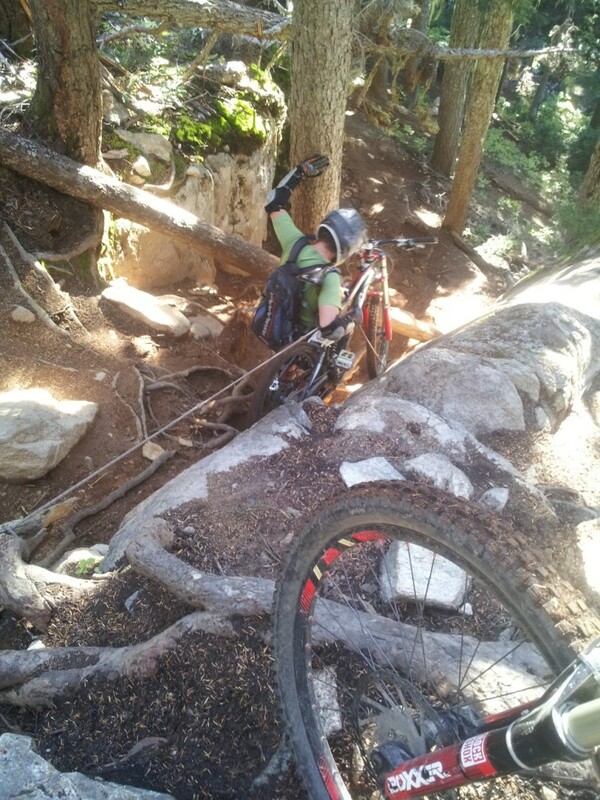 We were riding this steep unmarked trail off of Crank it Up when a root grabbed Marius’s front wheel and he had a medium speed face collision with a tree (see picture for dramatic re-enactment). 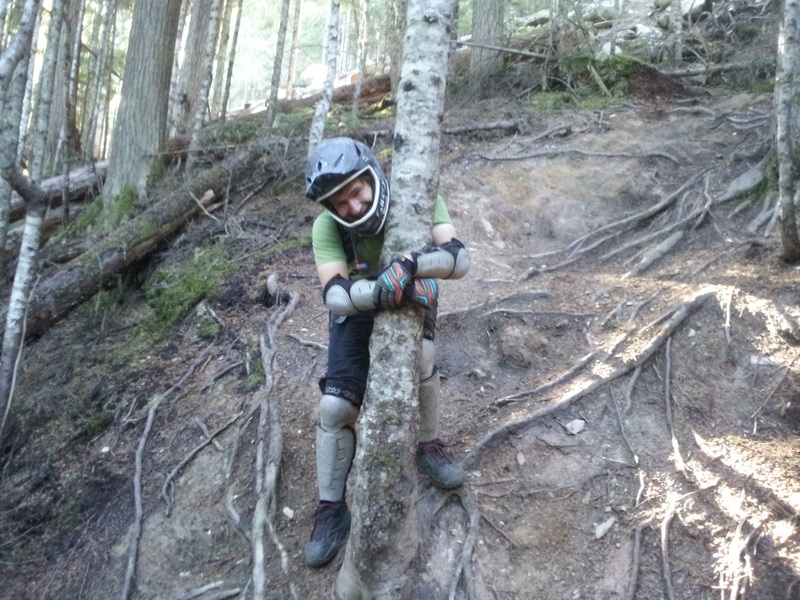 Then, with a new amount of determination he tackled the next steep part and immediately crashed again, and got his body wedged between two trees. This was before we were even on the trail that we came to ride! He was all good, for which I was grateful, and I checked my ego at the door and walked the sections which caused his crashes. Around 3pm we figured it was time to leave the bike park behind and start our hike. 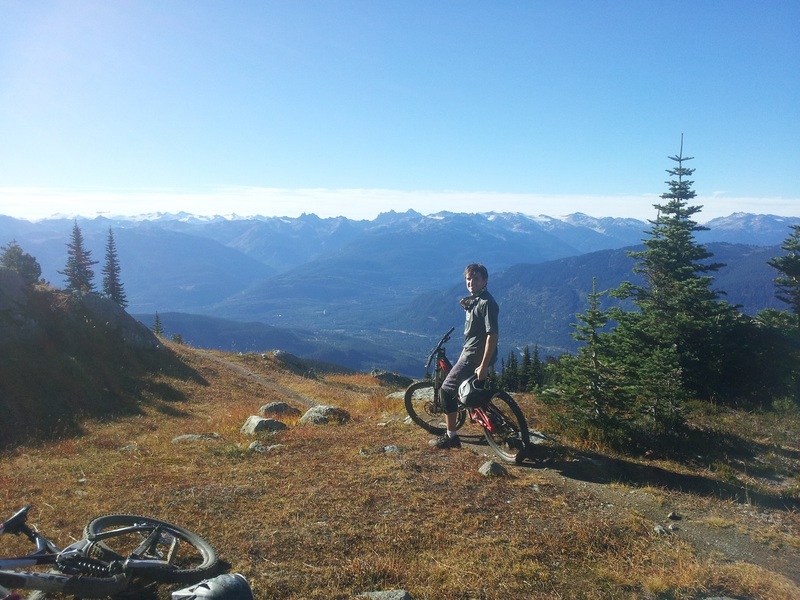 It was pretty uneventful, we just slogged out from Round House on a logging road around the bottom of whistler bowl. We eventually located the trail, had lunch, and also found the Stu Hut. The Stu Hut is a pretty run down shack at the top of the Khyber Area that doesn’t seem to have much mention anywhere. We descended via the Khyber Pass (steep and technical and fun! ), Upper Babylon (some crazy things, and a part where you can either air a huge death drop or lower your bike on a fixed line and scramble down after it), Babylon by Bike (Awesome! ), Duncan’s (a trail built in memorial of trail builder Duncan Mackenzie, who was killed by an avalanche in 2011), and AMPM. Riding Duncan’s was especially cool. Sense riding the trail, I’ve been doing research into his life. He actually flagged the route for this trail before his death, and then his friends built the trail he designed as a memory for him. The trail was pristine, and must have taken 100s of hours of work. What a beautiful life he must have lived to have touched so many people that they were willing to put all of the work into building his trail as a memorial to him. What a perfect memorial that riders can now experience joy on a daily basis, riding a line he chose, and feel what he must have wanted us to feel as he was bushwacking through the forest in 2011, envisioning something more. I feel a connection with him and his art, and I didn’t even know him. I think that’s a beautiful thing. At the highpoint of the pass. After the slog. Scramble down with the help of a fixed line. As usual, steepness not shown in picture, the line was needed. Finishing the day on Duncan’s. 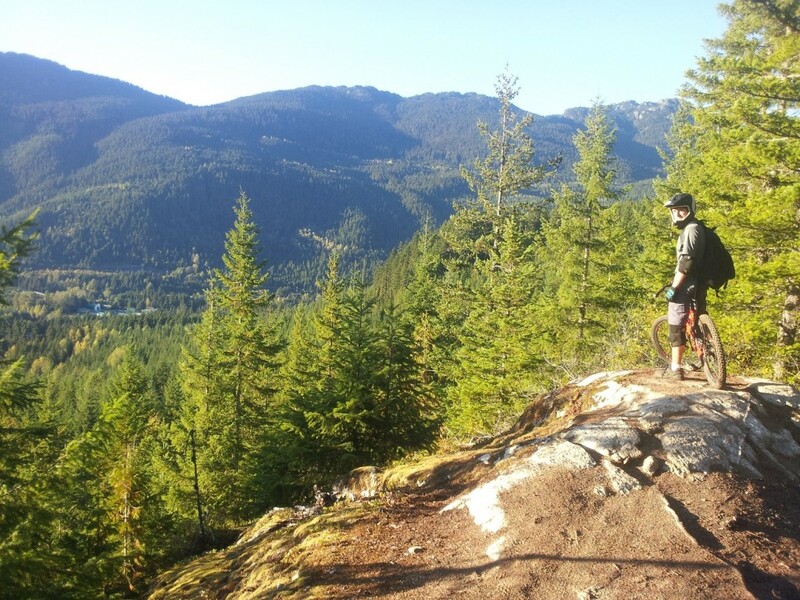 This entry was posted in Cycle, Trip Reports and tagged adventure, bike, biking, cougar, Face, helicopter, hike, mountain bike, scramble, Slog, summer, Weekend, Whistler, Winter. Bookmark the permalink. Awesome work guys! I love that crash re-inactment. Looks like the DH bikes were needed eh? I like the remoteness of this but it appears to be outside of my ability levels at the moment.